The Metrohm Stat Titrino Titrator 718 is designed specifically for STAT applications and is ideal for organic synthesis laboratories. This titrator system features parallel monitoring of temperature and performance of pH/time gradient, set endpoint titration, STAT for keeping a measure value at a constant, dosing with volume, time or rate control, or by a measured volume gradient, as well as measuring and calibrations. The stat titrino 718 has a pH measuring range of 0-20, a temperature range of -150 to +450°C, voltage 0-200mv and current up to 200 uA. The Metrohm Stat Titrino Titrator 718 is easy to control through easy to clean membrane controller keyboard, and show on the LCD display. Setting parameters, configurations and sample data are input through the keypad, and you’re on your way. When it comes time to collect data points, this titrator has a RS232 interface for the connection of a printer for your records or can be used to connect a balance. Through the RS232 connection, remote control of this titration system is possible. This titrator comes equipped with a magnetic stirrer with a speed range of up to 1900 rpm, and a 20ml exchange unit with a resolution of up to 10,000 steps. The titrino also comes with a drying bottle, a pH meter, a temperature probe, and a light resistant bottle. 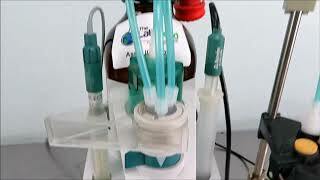 This Metrohm Stat Titrino Titrator 718 has been fully inspected and is performing to expectations. All of our lab equipment comes backed with our standard warranty. Should you have any questions, please don't hesitate to contact us.